India is a country of large numbers. The second most populous country in the world (over 1100 million), India has a large population of hearing impaired. With an estimated prevalence of 6%, there are over 65 million persons suffering with disabling hearing loss*. As per estimates, approximately 25,000 deaf children are added to the country's population every year. These figures denote the need to have a formal and systematic method to prevent the onset of hearing loss. Wherever it does occur, the adverse effects of this impairment can be controlled, to a great extent provided suitable and timely action is taken. Taking cognisance of these facts and based on the principles of Sound Hearing, the Government of India decided to initiate a pilot project for Prevention & Control of hearing loss in the country. 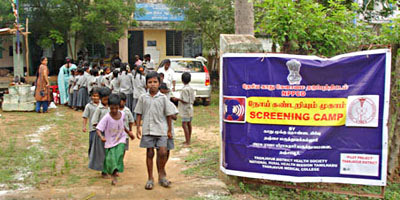 This project was started in 2006 and is based on the concept of 'HEALTHY EAR DISTRICT'. In the initial phase, this project was started in 25 districts over 11 states across the country. In 2008, this project has taken the shape of a full fledged National Programme and is to be gradually expanded to include 200 districts by the year 2012. The programme has also been integrated with the National Rural Health Mission under the Ministry of Health & Family Welfare, Govt. of India. The programme is a community oriented one and the District Hospital is the nodal point for the actual implementation of the programme. As the District hospital is the first point of contact between the community and a trained ENT doctor and Audiologist, it is the main focus of the programme. The District hospitals have been strengthened with the provision of equipment to enable diagnostic as well as therapeutic and rehabilitative procedures to be carried out here. An audiological assistant and a teacher for young hearing impaired have been posted at the district hospital under the programme. * Disabling hearing loss is hearing threshold greater than 40dB in the better hearing ear, in adults or greater than 30 dB in the better hearing ear in children. The Primary Health Centre (PHC) is the first level in the organised health care delivery system, where a qualified medical doctor is available to the community. The doctors here are being trained to reorient them to ear problems and provided with the basic diagnostic equipment, to enable them to diagnose, treat and refer the patients with hearing and ear diseases. Multi PurposeWorkers, Public Health Nurses and grassroot functionaries form the link between the community and the formal health care delivery system. They are now sensitized to the programme and to their specific roles in the programme for promoting community ear & hearing health. They have undergone training to enabe them to carry out their designated tasks. The School Health system plays a very important role in the programme. The School Teachers of the Primary section conduct a survey based on a questionnaire for the Primary children. Those found to be positive, undergo an ear check up by the school health doctors or the PHC doctors, who have received training in this aspect. 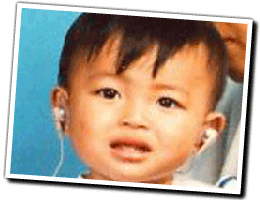 The School health doctors identify, treat and refer the children with ear and hearing disorders. The State Medical College are the Centres of Excellence which support the programme in the state with provision of expertise for training as well as patient care and referral. Community based camps that are held in different parts of the district every month. This helps to identify persons with ear diseases as well as hearing loss. Suitable therapy can be started at the camp, when possible or the patient referred to the district hospital for investigations and treatment. Diagnosis & Medical Treatment: Patients are able to seek treatment at the PHC as well as the District hospital. At the PHC, the Primary level physician examines the ear of the patient with the equipment provided under the programme. They can provide or start the treatment when possible. Those patients who cannot be treated at the PHC, or who require investigation or special treatment are referred to the District hospital. Surgical treatment: The district hospitals are being equipped to provide all possible surgical options that are commonly required by a patient suffering with ear disease. Audiological diagnosis: Most audiological diagnosis can now be carried out at the District hospital with the help of the equipment provided (Pure Tone Audiometer, Impedance Audiometer, OAE Analyzer), done by the Audiologist as well as the Audiological Assistant at this centre. Referral to tertiary centre will be required only for the purpose of special investigations such as the ABR (Auditory Brainstem Response). Hearing Aid fitting: Children under the age of 14 years who are identified under the programme and adjudged by the ENT Surgeon and Audiologist / Audiological assistant to be in need of a Hearing Aid will be fitted with a hearing aid free of cost at the District hospital. The Hearing aid will be fitted with a custom made mould and maintained (other than batteries) free of cost by the Hearing aid supplier under the Programme. The same benefit can also be extended to other beneficiaries (above 14 years) under the programme at the discounted cost as per the government rate contract. Hearing and Speech therapy, Rehabilitation: provided to those needing it at the District hospital. The District Audiologist/Audiological assistant provides these services. This is to be accompanied by educational rehabilitation by a Special teacher at the District hospital. Besides the above nation wide programme, efforts are also being made to incorporate other concepts of Sound Hearing at the national and sub-national level. These include 'School ear & hearing check' and 'Less noise cities'. The School Ear & Hearing check is underway in the schools of Delhi in collaboration with local NGOs. The proposal for Less Noise Cities has been put up in the city if Delhi and the government has initiated preliminary studies in this regard. If you are a Screen reader user click on the Stop link to stop the scroll for Profile of Supporting Agencies and access the profiles of supporting agencies. © 2010 Sound Hearing 2030. All Rights Reserved.